This is my article on Don Valley for the Groove. Let me explain a bit about restaurant Introductions. When I do an introduction, I have been invited to the restaurants to write an article about the place. The restaurant will foot the bill, so unless there is something substantially wrong, I will keep my write up very positive. It is more of a descriptive piece of writing, rather than critical. 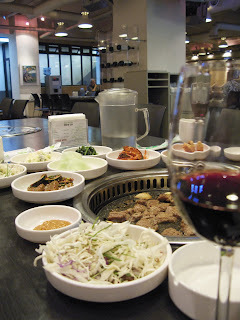 When the Tracey, Sara and I were invited to Don Valley for a meal, I was surprised to hear that all 3 of us had not been to this Korean Barbecue Restaurant. I mean it’s not in a hidden away alley. It’s located below the Coffee Bean as you come out exit 3 of Itaewon Station. I hadn’t heard bad reviews of the place, nor do I dislike their type of food. The reason why this place wasn’t on our radar is because when most people come to Itaewon, they want to eat International Cuisine such as Thai, Indian, American, and go to bars. Don Valley targets tourists and expat customers. They have gone out of their way to be ambassadors of Korean cuisine by transcending the stereotypes of your typical Korean BBQ restaurant. They provide a large spacious interior, vary the food to the western palate, and add creative twists that make dining at Don Valley a fun experience. I mean, how many Korean BBQ places do you see offering grape soda, wine by the glass, Perrier, Wine Samgyeopsal, and Haagen daz ice cream? Don Valley will even let you order a single portion of meat instead of the usual Korean minimum of two. We started with the “Wine Soaked Pork Belly.” A thick cut of pork belly came to the table on a bamboo stalk plate. This slab was put on the grill to crisp and then “6” put our grilled pork to the side of this. As the savory scent of meat flittered up, we went to work on the side dishes on the table. Your usual, “foreigner friendly” side dishes were present. There was some kimchi, spinach, wasabi turnip, and salads. As “6” added a hefty portion of mushrooms and garlic to the grill, she took the slab of pork belly and cut it into small pieces at the table. When everything was cooked, she invited us to eat. The samgyeopsal was tender and fatty. I don’t know if the wine really added anything to it, but it tasted good. The pork ribs were extremely tender and the sauce on the ribs heighted the meat flavor without being too sweet or tart. The three of us worked our way through the pile of meat. “6” watched us from afar and was always ready to pour us more wine or refill our side dishes. Then it came time for the large slab of “Grilled Beef Rib.” I looked at the large chunk of meat before me and I was thinking, “a piece this big can’t cost only 25,000 won.” Sara, must have understood my perplexity and asked “6” which country the meat came from. “6” told us it was from America. Before it was grilled, beef was scored on each side in opposing diagonals. When the meat is held up, it looks like a hand woven scarf. After being scored it was marinated in a tangy, sweet, savory sauce. Again, the sauce was nicely balanced and the meat just looked so tender that I wanted to just take a nap on each morsel. The American Beef tasted great and I didn’t feel even a tiniest bit “mad”. We didn’t have room for dessert, but the thought of having ice cream did tempt me. Overall, this was a very enjoyable experience. It’s a great place to hang out if you are with a large group or if you are hosting visitors to Seoul. They also welcome those that are alone and want to grab a quick bite for dinner. It is a bit more expensive then your neighborhood BBQ house, but for it sure wins in the atmosphere, service, and variety categories. Tracey Stark added, “Also, if you missed the last subway out and you didn’t feel like paying 30,000 or whatever to take a taxi to Bundang, you could just sit here and drink, eat and relax. Then go to the Hamilton Sauna for the night.” I guess that’s just how Tracey rolls.